Annalise has just graduated from D&B Academy of Performing Arts. 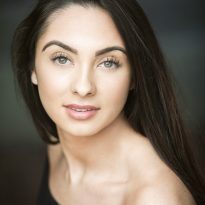 Her credits include numerous Pantomimes, most recently playing Belle in Beauty and The Beast at The Grange Theatre, Hartford. She has also recently appeared in the E4 TV Programme ‘Stage School’. Annalise is delighted to be playing the role of Penny in the UK Tour of Hairspray. She would like to thank her family for their love and support, and D&B for all of the guidance and opportunities over the years.